Over the last few months we have been developing the brand and communication materials for an exhibition that we are working on. The exhibition taking place later this year in Manchester, will showcase the history, culture and customisation of Harley Davidson motorcycles. 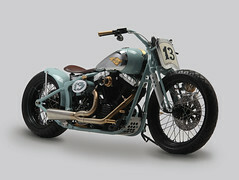 Here's a quick taster that saw its way over to the Irish Motorbike and Scooter Show 2011 in Dublin. Keep an eye on the blog for more information about the exhibition.